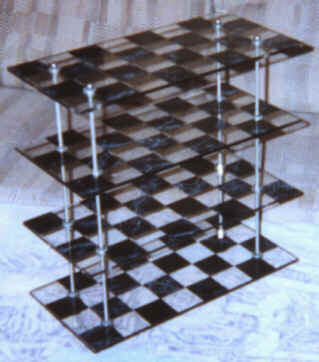 This version of 3D chess was invented by my father around 1970, in response to the 3D craze started by Star Trek the original TV series. 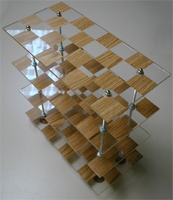 (This does not resemble Star Trek 3D chess - it has seven boards and some of them movable). I believe Quadlevel is the most playable version out there. Especially with the revised rule set. Over the years, we have found some things really work, and other things not so well. It's possible that while playing this game, since the concepts are very similiar to regular chess, it can help with your 2D game. It's like picking up 3 bats and going to the plate with 1. A booklet written by Robert Koernke Sr. my father is still available at the Ann Arbor University of Michigan Undergraduate Library entitled "The Complete Rules of Three Dimensional Chess" copyright 1970. The only major change in 30 years is the 'Standard' win version. Originally you had to checkmate both Kings, which drags the game out too long. My father and a man named Gerhard Fritsche(Gary) would go to what is called in Ann Arbor, MI the Diag, where the crossroads of the U of M students come together, and play the game in front of a crowd of 50 or so. 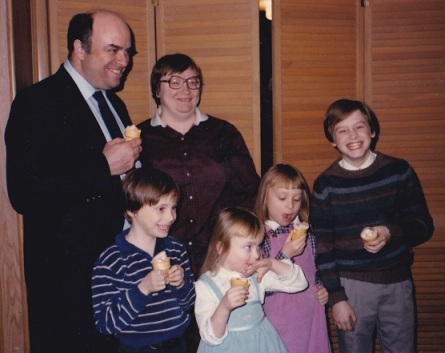 My father had never given it a distinct name other than 3D Chess. We decided on 'Quadlevel'. Some of the same openings are possible, very similiar to Queens Gambit Accepted/Declined. Getting used to playing this game is only a matter of figuring out that the Knight has gained some power over the bishop and is now possibly as strong as the Rook. This is because of the board size has hamstrung the bishop in a bit. I put up a strong defense for the 'The Change in Distance Rule'! (I find a lot of resistence to this rule from the 3D community. They like things unplayable, convulted, and complicated. I suppose it's in our nature.) There is castling! No funky pieces, but two Kings and Queens. In fact it has two full sets of chessman. There is no (Tri)Diagonal as some have termed it, in the regular variants. The game-length is roughly the same as regular chess. Because it is an 8 rank game as 2D chess, a double pawn move is allowed in Quadlevel. 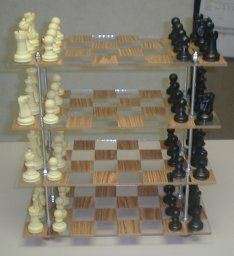 The home rows for each side are completly full of pieces, as opposed to lot of other 3D chess versions. The squares are alternating between boards, as they should be to make 3D movement the same as 2D movement. I believe Quadlevel is one of the easiest to learn of 3D chess games, because so much of it is intuitive from 2D chess. Piece movements are strickly the same as 2D on a 3D board.